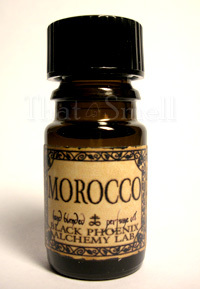 Morocco is among one of the Black Phoenix Alchemy Lab’s more popular fragrances. Morocco conjures up romantic images of drinking tea in one of the most vivid nations in the world. The fragrance is BPAL’s interpretation of the place, using spices and warm milky notes to bring forward a very lovely gourmand fragrance. In Bottle: Creamy, sweet tea with a touch of spices. I want to say I’m smelling saffron, nutmeg and cinnamon blended into a warm, milky, spicy beverage. There’s a touch of sweetness to this too that helps Morocco avoid being a hit of spices and milk. The sugar adds a much needed dimension because the sugar helps tip Morocco into gourmand territory. Applied: Spices and milk before the milk settles off. Morocco moves along, carrying its cinnamon and nutmeg scent as sugar trails in behind. The fragrance ages into a slightly spicier piece of work when carnation starts to bloom. As Morocco continues to unfold on the skin there’s a touch of something musk coming up and intensifies as the dry down continues to wind its way through the streets piled high with spices and milky tea. Final dry down is a lovely creamy musk and woods. Extra: BPAL fragrances are perfume oil blends. Which means they are fragrance oils set in carrier oils. This means the fragrance is set in an oil base such as almond oil or jojoba oil instead of alcohol and water. Design: Morocco is contained in a 5ml amber glass bottle with a plastic top, just like other general catalog Black Phoenix Alchemy lab fragrances. Notes: Spices, milk, sugar, carnation, sandalwood, cassia. I do like Morocco, really and I was leery to even try it because of the spiciness. Sometimes too many spices can be a bit much to handle but Morocco strikes a very agreeable spice middle ground. Reviewed in This Post: Morocco, 2009, 5ml Bottle. This entry was posted in black phoenix, gourmand, Reviews By House, spicy and tagged alchemy, black, blog, bpal, fragrance, lab, milk, morocco, perfume, phoenix, review, scent, spice, sugar, tea. Bookmark the permalink.